"The sweet pulp of marshmerrow reeds is a delectable foodstuff, and when eaten fresh or prepared, it has modest healing properties. 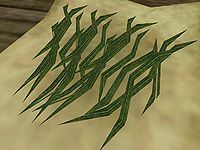 Marshmerrow is an important cash crop of the farms and plantations of the Ascadian Isles, but it also grows wild in the Grazelands and on Azura's Coast." 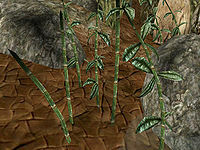 Marshmerrow is one of the most abundant ingredients in Morrowind, growing in large numbers wherever there is water. Synnolian Tunifus will ask you for some samples in Gathering Marshmerrow, his first quest for the Imperial Cult. Gathering Marshmerrow: Retrieve five pieces of this ingredient from a Pelagiad farmer. This page was last modified on 8 March 2016, at 04:28.